It is always best to book your hair and makeup trial a few months before your wedding. You should have your dress by then and have a very good idea of the look you are creating for your special day. If you are doing a destination wedding then you need to do the trial when it is convenient, as close to the wedding as possible, this way you will be very sure of what you want. Once you have booked your hair and makeup trial with your professional hair and makeup artist, start sharing pictures of yourself, your dress plus hair/makeup ideas you like. At this point, you should have been working for the last 6 months on getting your hair and skin in the best possible condition, remember with better skin you will get better results, please see my past blogs. Give yourself time for your trial, it can take up to 3 – 4 hours for hair and makeup, this is very important as you don´t want to have to pay for another trial later. Be prepared on the day of your trial, ask your stylist what you should bring. If you are wearing a veil or a headpiece it is important to take this also. If you have your jewelry it could be a good idea to take this. 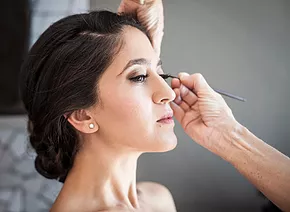 Wear a white t-shirt that is similar to your wedding dress so you get a good idea of the finished result, wearing dark colours is not going to work well with natural or bridal makeup. Remember don´t choose cheap, you have just chosen the dress of your dreams you must look your absolute best in that dress. Ask your Hair and Makeup Artist what makeup they use as you need the best, the makeup needs to stay on for 24 hours, and you need to take different measures to make this happen. Also you need to know how to take care of your makeup throughout the day and evening, so you still look picture perfect. Previous PostWhat will your choice of makeup be this Fall/Winter?